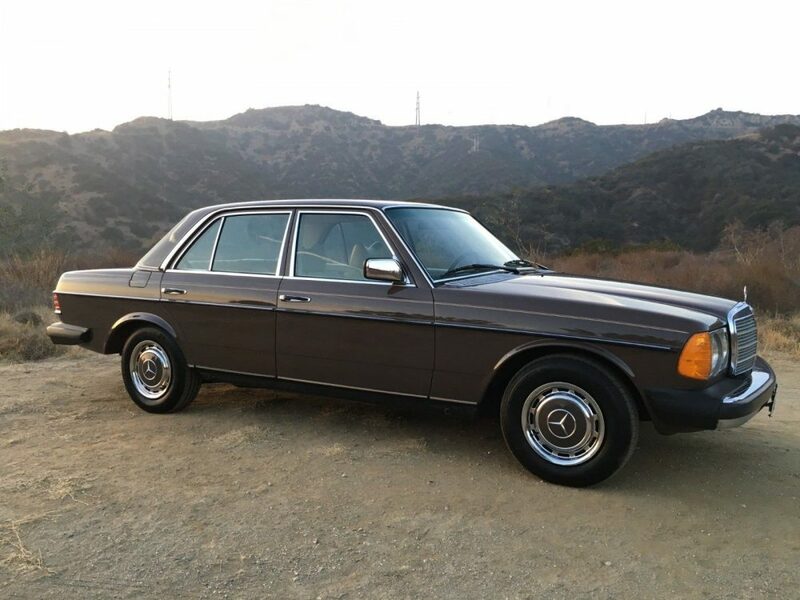 Up for auction with NO RESERVE is my 1979 Mercedes 300D with 54,000 original miles,Texas and California car its entire life and it shows. I have over 200 pictures of most angles of the car, including underside, and can share them via dropbox. Send me a message if you’re interested and your email and I will send them to you. It pains me to sell this vehicle, as I looked for one in this color with low mileage for years, but we are moving and I am losing my garage space. I purchased this vehicle from California and had it shipped to New York this past spring and I have the paperwork and documentation to go with it. It is very evident this car has been babied and well cared for its entire life and the documentation shows such. The original plastic is still on the tool kit in the trunk. Everything works, including the AC and even the clock. The car has been serviced and been gone through thoroughly by a Mercedes mechanic, with all fluids changed, flushed, hoses and necessary parts replaced as they should be due to age (water pump, belts, hoses, thermostat, etc.). There isn’t any rust and clearly never was. The carpet is incredible for its age and carpet color is vibrant and clean. 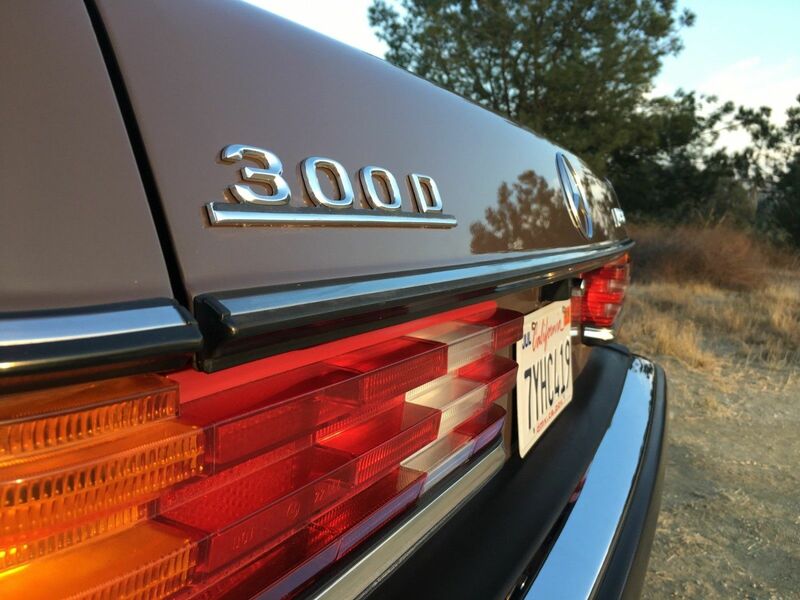 You will not find another 300d that has this mileage and condition. It’s a 40 year old car so it’s not perfect but Iâ€™ve seen a few of these over the years and none were ever this clean. Even the antenna motor is original – I took it apart to see why the mast wasn’t going down all the way and it was like new on the inside. A new mast was installed and it functions like new. Transmission is automatic and shifts perfect with a new. Brakes are good with plenty of mean, smooth, with no leaks and stops as it should. There are absolutely no dash cracks. The car runs and drives straight, right, strong and great! There is not any pinging and knocking. I left it out of my garage the other night to attempt a cold start, without plugging it in. The temperature was 19 degrees and the car started right up at 5:30 in the morning. Tires are new with only 3,000 miles on Michelin Tires. Battery receipt is show in photos and is newer. 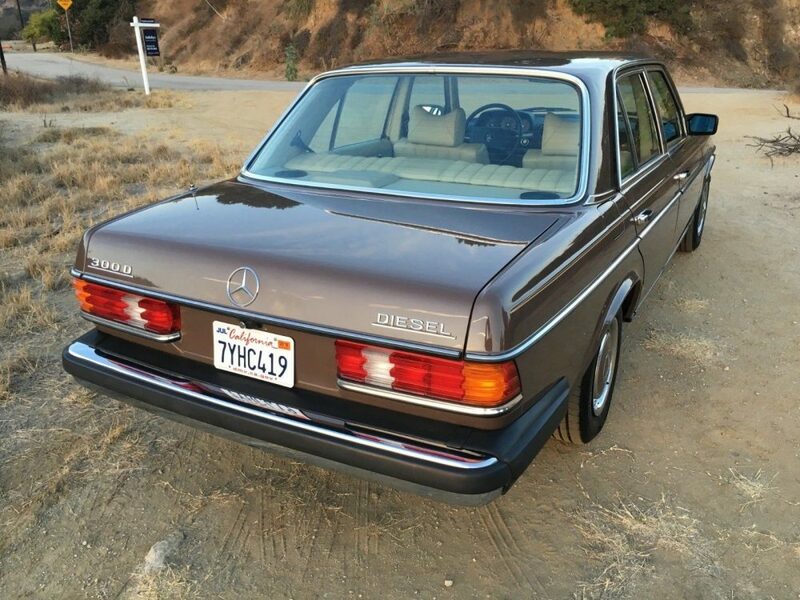 The car color Topaz Brown over Parchment MB-Tex. The main previous registered owner was an aerospace engineer and Air Force veteran in Rockwall, Texas, who kept the car from 1984 until his death in early 2017. After the previous owner purchased the vehicle in Texas, a new battery was installed along with new Michelin tires, belts, and a water pump. Approximately 2,800 miles have been added since, the majority of which were accumulated while driving the car from Texas to California. Power comes from a 3.0L OM617 diesel engine mated to an automatic transmission, and the car is unmodified apart from the addition of a vacuum gauge(removable without any holes in the dash. It is as simple as lifting it up as it is only resting there and is showed in the pictures), fuel filter, and auxiliary fan. 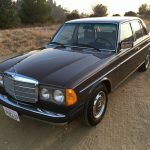 This W123 is now being offered for sale with two master keys, one valet key, original key ring, a set of replacement belts, all of the manuals, brochures, receipts, an owner’s manual, toolkit, service log from the previous owner, over $5k of recent receipts since 2018 to get the car ready to drive without worry, and a copy of a clean Texas Title from and a copy of a clean California title and California plates(transferred to current owner) along with a clean New York Title, in the seller’s name. The car was brought to New York in spring of 2018 and has never seen snow or northeast weather. It is stored in a garage and has always been garage kept. The Topaz Brown (424) finish shows some blemishes and chips which are detailed in the gallery. The rear passenger-side door shows checking with a few marks caused by someone burning through the finish with a buffer. I had a quote to paint it of $360, but the auto body shop said to leave it since the car is so original. He thought that maybe that door was repainted at one time and that why this checked and the rest of the vehicle didnâ€™t. 14″ steel wheels have paint-matched hubcaps and Michelin Defender tires that were installed in June 2017, with about 3,000 miles on them. A four-wheel alignment was performed at this time and all receipts are in the gallery with the alignment results. The front windshield and both windshield seals were replaced in 2017, and Sekurit stampings are present on all other glass as viewable in the gallery. The original antenna mast was replaced, and works properly. The original antenna motor was in clean working condition (almost new). The first-aid kit is intact and appears to be untouched. Inside, the Parchment MB-Tex appears in good condition with a small puncture evident in the driver’s seat bottom. 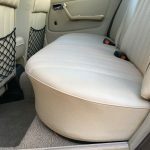 The cabin shows little wear, with clean loop carpeting and taut rear cargo pockets â€“ this is rare as they are normally stretched out, but not in this car. They are perfectly tight. The door seals are cracked in a couple of places, but do not leak when washed. These seals are still available, cheap, quick and easy to replace. The car isn’t driven in the rain and do no leak when washed so I’ve left them. No cracks are present in the dashboard. 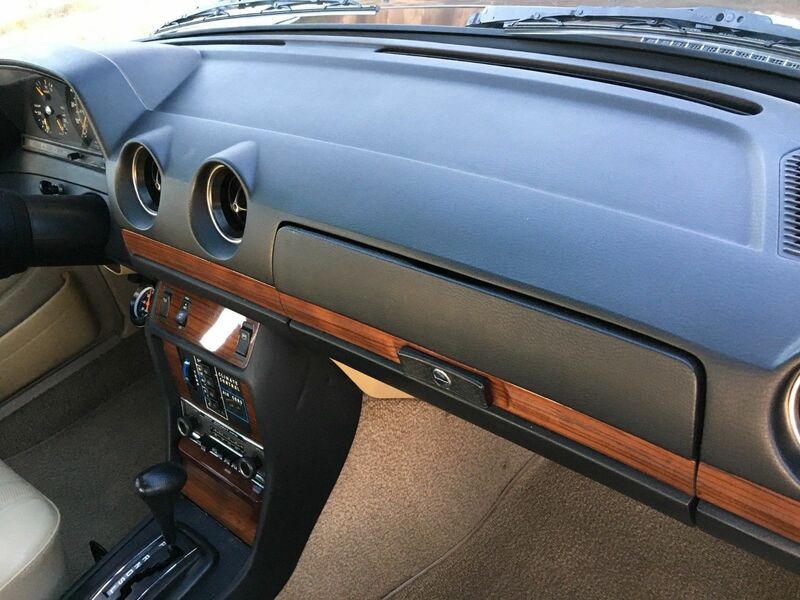 Zebrano wood trim looks glossy and intact with no notable chips or cracking. The A/C has been converted to r134a and does blow ice cold and a new A/C servo was installed in June 2018 with a recharge and test to the system. Brake fluid was flushed and replaced and all wheel cylinders were checked and confirmed to be in working order without leaks in June 2018. The clock is functional. Other interior components work properly, including the factory Becker Europa stereo, cruise control, power windows, and vacuum-powered door locks. 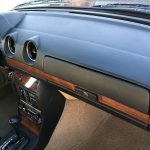 The previous owner added a vacuum gauge on the under-dash panel which is easily removable without any affect to the interior as it is simply resting in place and not mounted with holes or tape. The roughly 54,000 miles indicated on the six-digit odometer are accurate. 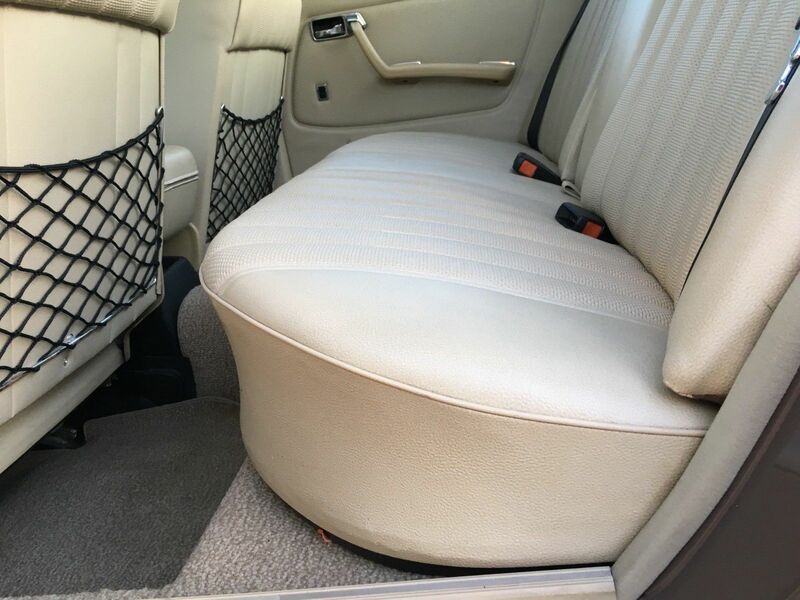 The pedals of the car are in immaculate condition and the carpets show little wear and no holes. I installed custom cut all-weather matts in June 2018 to further protect the carpeting. All normal wear items on the car match the mileage. Car has had over $5,000 invested into it in the last year and a half. I wanted the car to be able to go out on cruises with my family and be trouble free, so I replaced every item I could think of that would typically age and could cause a problem. This includes rubber vacuum lines, vacuum shut off, vacuum valves etc. A factory toolkit, jack, and replacement belts accompany the vehicle. The 3.0L OM617 five-cylinder diesel engine was rated at 87 horsepower when new. Maintenance performed during the last 3,000 miles has included a new water pump, A/C belt, alternator belt, power steering belt, neutral safety switch, complete fluid flush and replacement, thermostat, and radiator cap. AC Service: AC charge, AC test, AC Servo with improved design of aluminum body($700), AC Amplifier, A new battery was also recently installed. The vacuum pump diaphragm has been rebuilt, and the oil and filter were changed approximately 100 miles ago. When the water pump and vacuum pump work was done I had the thermostat and fan clutch replaced as precautions as it was already disassembled for the vacuum pump rebuild. Included are: service records, original manuals, receipts, California plates, California Title, copy of the Texas Title, Obituary from previous owner, a very detailed handwritten log from the previous owner that begins at 20k miles and ends in 2013 at 50k miles when it was transferred to new owner(from Texas to California), after owners passing. The car is a time capsule and worth the investment. The car shows very well and must be seen to be appreciated. The paint has scratches and dings but shines nicely and is great example of a survivor â€“ a recent full detail was completed on the car. I will assist with getting this on a truck and may be able to deliver for a fee depending on location. Contact me before bidding. Shipping is the responsibility of the buyer. A $500 deposit is due within 24 hours of the sale via PayPal and remainder of the payment is due cash in person or wired to my account directly. If you want me to accept a bank check it takes a full 30 days before the car can be released. I was burned via eBay on a bank check once and it wonâ€™t happen again. If you have questions, please ask before bidding. If you would like to see the car I am happy to show it and would prefer you did see it before buying or bidding. Full payment must be made within 7 days. I may be able to store the vehicle for a little while, but arrangements must be made first. I reserve the right to end the auction early for any reason. The vehicle is being sold as is where is without any expressed or implied warranty on any component of the vehicle. Spare tire was stolen during shipping from California. Brown is a tough color if you don’t stay on top of keeping it nice and thankfully, this one looks amazing. To be honest, almost everything on this car looks amazing. 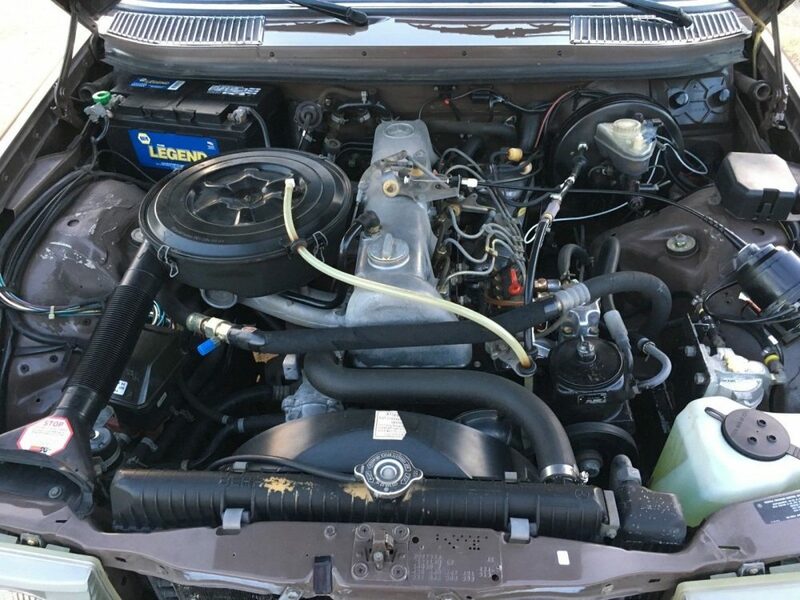 The seller lays it all out and goes through a laundry list of repairs and upkeep on this W123, so I am confident it performs as good as it looks. He even went through the trouble of fixing everything wrong with the forsaken Chrysler climate control system to keep to running as it should. Not an easy or inexpensive task to say the least. 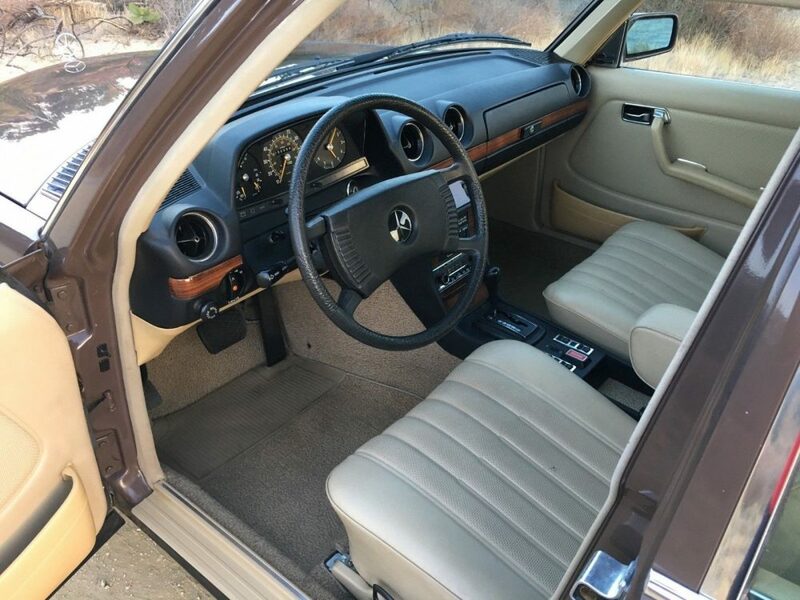 The inside of the car looks great without any major flaws and even the carpet is in excellent shape. There isn’t much I can say more about how great this car is and how well it has been cared for. Naturally, all this greatest is going to come at a cost. This is probably going to easily be a $15,000 example and maybe even $20,000. This is without a doubt a ”collector car” and is going to remain that way. 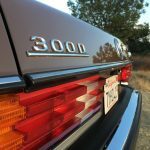 It is in that sweet spot of having just enough miles on it where you don’t feel super guilty about driving it now and then, but not so many miles that it isn’t consider low miles. I’m excited to see where this one ends up. 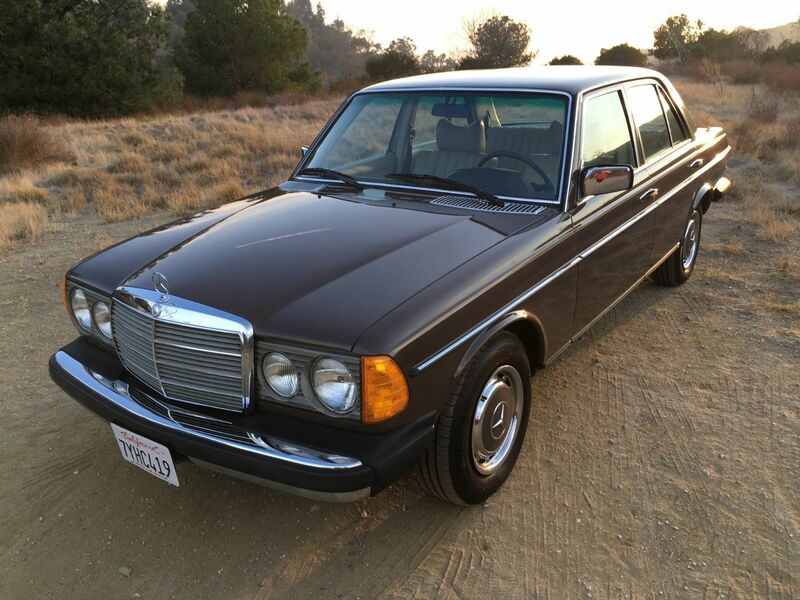 Tagged 1979, 300D, diesel, Mercedes Benz, OM617, Topaz Brown, W123.